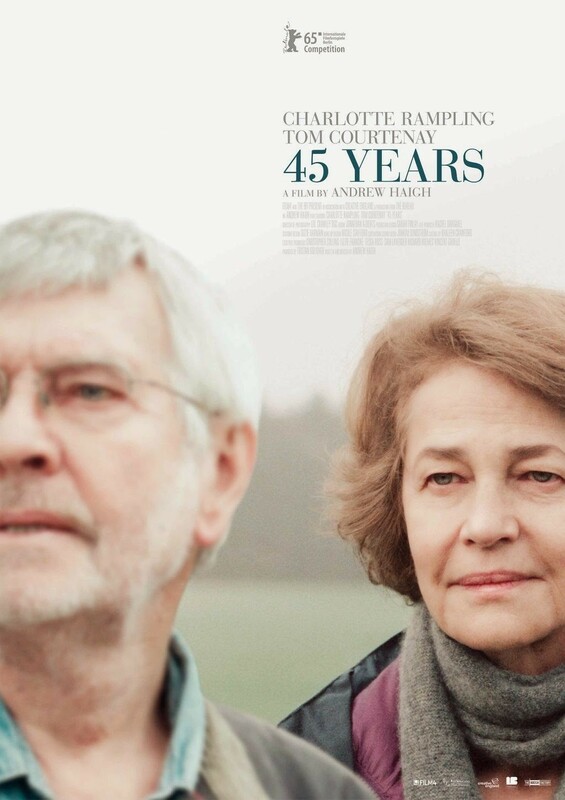 A couple, Geoff (Tom Courtenay) and Kate (Charlotte Rampling), are preparing to celebrate their 45th wedding anniversary when Geoff receives a letter from Sweden saying they have discovered the body of his ex-lover Katya, who had died in a hiking accident 50 years prior. This brings old memories back to Geoff and leads Kate to question their entire relationship. "45 Years" is a little known independent film that can now say it has an Oscar nomination under its belt. Charlotte Rampling has been nominated for Best Actress at the 2016 Academy Awards, so in an effort to see each of the films nominated for any award this year, we decided to check it out one night. Indie movies tend to fair very well with the Academy, and this movie is exactly up their alley. It is slice-of-life character sketch focusing on the week leading up to an elderly couple's 45th wedding anniversary. The film opens with Kate, played by Charlotte Rampling, returning home from walking their dog to find her husband Geoff, played by Tom Courtenay, trying to read a letter written in Swedish. This letter details how the body of his former lover, a woman named Katya, had been found after 50 years of being frozen in the ice. From there, past thoughts, memories, and previously undisclosed secrets begin to flood Geoff's mind and life, which also impacts Kate, too. "45 Years" explores how this letter affects both of them in very different ways, possibly bringing Kate and Geoff's nearly half-century relationship into question. BigJ and I, for once, differ in our opinions about "45 Years." BigJ feels one way about it (very strongly, I might add), and I feel slightly different. BigJ found the movie to be a slow, run-of-the-mill indie flick, much like the hundreds of other indie films we have seen so many times before it, only showcasing an adult relationship instead of a younger one. He found Kate to be a character that lacked understanding as to how her husband feels, how losing Katya affected him all those years ago. Of course, receiving the new about how someone from your past has died would affect anyone. It would most likely lead even the strongest person to reminisce about the days of yore. Kate believe that, in some abstract sense, Katya and Geoff's relationship affected his perception of her, secretly influencing their own marriage over the past 45 years. In fact, the more he thinks about it, the angrier he gets. To me, it's not so simple, and this movie is certainly not bad enough to cause such anger within me. There was clearly more going on during Katya and Geoff's relationship than just a simple fling. This person was the love of his life, and she died, young, too. That's the definition of a tragedy. Geoff probably would have married her instead of Kate if Katya hadn't died 50 years ago. Instead, 5 years after Katya's death, he married Kate and moved on with his life. Here's where it gets complicated for me. Can you, dear reader, honestly say this piece of information wouldn't affect you in your marriage/relationship at all? Learning that your spouse was so deeply in love with someone they intended to marry, but they died and never told you the details over decades of time? What was there to cloak? I agree with BigJ when he says that Kate has a lack of understanding and compassion for him, and the revelations she discovers are certainly not enough to being 45 years of marriage crashing to the ground. Regardless of how we feel individually, what really stands out in this movie is the acting. Charlotte Rampling and Tom Courtenay give nice, subdued performances as they both stew is subtle anguish. Though the meat of the story is from the past, their roles in the present, their conflicts, their sadness, their pain, will be nuanced long into the future of their relationship. When push comes to shove, 45 years of a relationship is nothing to discount. By today's standards, this is a very long marriage, so to throw it all away on something that happened 50 years ago and before Kate even entered the picture...well, it seems like she's just looking for an excuse at this point. Though the film is but an hour and 35 minutes long, it does feel its length and then some, moving through details at an alarming sluggish rate, though this might have been intentional to make it feel each minute of their strife. In the end, who knows. I feel like "45 Year" is the type of movie where men and women, and the young and the old, may have vastly different opinions on the matter. This will be one of those films for BigJ that will simply fade into obscurity like so many others like it, and to me, well, I didn't hate it, but I doubt I'll ever want to revisit it. One year ago, we were watching: "Oldboy"